Dream Big! Be inspired to be STEAM leaders! 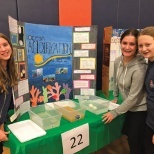 These were some of the messages at Ma’ayanot’s fourth annual STEAMTalks, an exciting program that inspires students to pursue careers in science, technology, engineering, the arts and math. After a celebratory breakfast, freshmen and seniors heard from seven women who work in a wide variety of STEAM jobs. 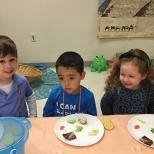 “Our goal is to get our students excited about the school-wide STEAM program, and to introduce them to role models who can encourage and empower them to pursue STEAM career opportunities,” says Gila Stein, director of Ma’ayanot’s STEAM program and chair of the science department. 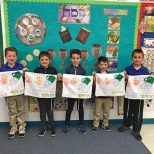 The STEAM program is sponsored in part by the Jewish Federation. This year’s STEAMTalks speakers included: Aviva Mael, a software engineer at Cedar; Raizy Beren, who works in social media marketing and graphic design; Dr. Miriam Keltz Pomeranz, a dermatologist at NYU/Bellevue Hospital; Dr. Leah Ben David, assistant professor of chemistry at Vassar College; Tzipora Leiser, an analyst at BlackRock; Chana Stiefel, a science writer and children’s author (and director of public relations at Ma’ayanot); and Liran Weizman, a technical product owner at JP Morgan. Each student selected three sessions, during which each speaker shared her passion, accomplishments and challenges in achieving her career goals. Freshmen also participated in a virtual reality activity, creating 3-D tours of Ma’ayanot using Google VR apps.